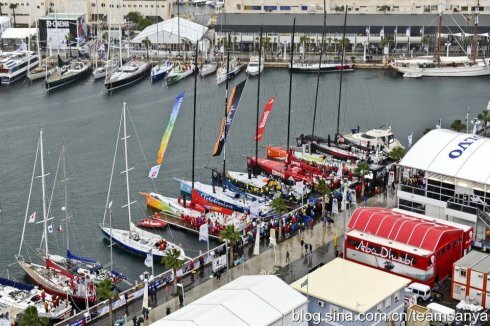 Team Sanya, the Chinese entry in the 2011/12 Volvo Ocean Race, took fourth position in the inaugural in-port race in Alicante Spain. “I am pretty pleased with the result. To be honest, our team made a weak start because all our opponents use new ships but ours is a modified one. With everyone’s persistence, I believe we can get a better result,” said Captain Mike Sanderson over an interview after the racing. Abu Dhabi Ocean Race Team, led by British skipper and double Olympic silver medalist Ian Walker, led a massive 14-minute win over Puma Ocean Race Team. Camper with Emirates Team New Zealand was in third. Team Sanya edged Groupama sailing team for fourth, with Team Telefónica coming home sixth. In-port races take place in all 10 Host Ports around the world, testing the crews’ skills at close-quarters tactics. 20% of all points calculated in the in-port racing will prove vital when overall positions are decided. The races also provides a show for the millions of people who will watch the race worldwide.